Pepperoni pizza bread: With 3 types of cheese, a slew of pepperoni, and a butter-herb crusted top, this simple pizza bread is as easy to make for a weeknight meal as it is to make for a crowd on game day. It’s no surprise that we’re big fans of pizza but there are some nights where homemade pizza just feels like it takes a little too long to make. 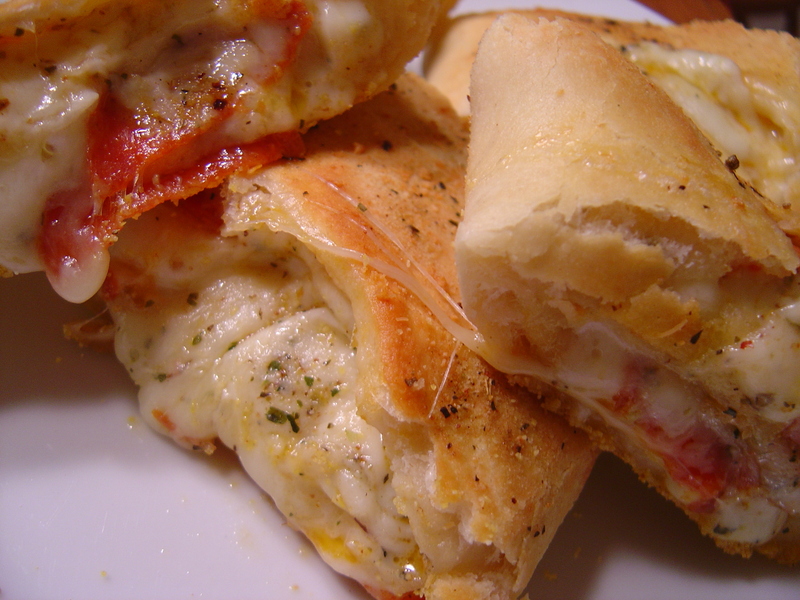 However, when you’ve got that hankering for cheese and bread, you might consider making a pizza bread…or stromboli…or pizza pop…or pizza roll…or whatever you want to call it! The first time we made this pepperoni pizza bread a few weeks ago, we used the pizza dough that Annie introduced me to. I made a full recipe and split the dough in half, using one half for pizza and freezing the other half, which in the end I used for this bread. The dough was seriously fantastic when we made that pizza, so I knew it would be perfect for this bread as well! There really is no set recipe for what to put in pizza bread. You can basically stuff it with whatever you want! We used pepperoni, mozzarella and provolone because it’s what we had on hand. Buuuut, you could use any variety of veggies: spinach, broccoli, artichokes, asparagus, zucchini, etc. The cheeses are pretty standard: mozzarella is a given but you don’t have to use provolone and you could absolutely add some ricotta. Yes, ricotta! Meats are your choice as well: pepperoni, ham (Italian or otherwise), salami, prosciutto. You get the point. If you want to move away from the traditional Italian flavors, you could use herbed goat cheese with figs, gruyere or swiss with ham, or brie with sliced turkey. The possibilities are endless! The only thing I seriously recommend doing for this pepperoni pizza bread is not skipping a slather of melted butter on the dough before you bake it. The butter gives the crust a wonderful flavor that complements the salty filling so wonderfully. I have to say that we loved the dough for this pepperoni pizza bread SO much! It not only works perfectly for all types of pizza but also beautifully with this bread and I’ve decided to make this my go-to homemade pizza dough recipe from here on out. Now there’s a reason to keep eating pizza! Not that we need one. Ha! Oh and P.S. – you might want to have your cholesterol medicine on hand if you’re going to make the recipe below as we made it. Just sayin’! Go bonkers with stuffings for this bread if pepperoni isn’t your thing! Preheat a pizza stone in a 500° F oven for 20 to 30 minutes with a pizza stone inside if you have one. You want the oven super hot. Dust a clean work surface with flour. 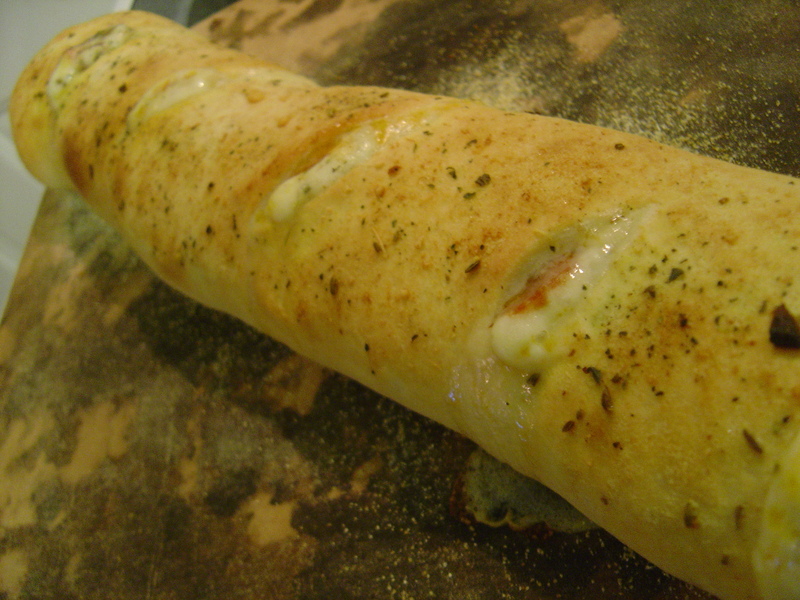 Roll out dough into a long oblong shape, about 12 to 14 inches long and about 8 inches wide. Visually divide the dough into thirds long-ways. Down the center third of the dough sprinkle half of the mozzarella cheese, place half of the provolone, sprinkle with oregano and a little Parmesan cheese, and layer half of the pepperoni. Fold one side of the exposed dough over the stuffed center. Repeat a layer with the remaining cheeses, oregano, and pepperoni on top of the dough half that covered the first layer. Fold the remaining 1/3 of the dough over the stuffed area and wrap it under the log. Wrap the ends under the log as well. With a sharp knife, make 4- 5 slits on the diagonal into the top of the dough to allow the bread to vent while it cooks. Using a pastry brush, brush melted butter over the top of the bread and down the sides. Sprinkle with pizza or Italian seasoning. When the oven has fully heated, carefully remove the stone from the oven and sprinkle it with cornmeal. Place bread on the cornmealed stone and bake for 12 to 14 minutes until nicely browned. Remove the stone from the oven and allow the bread to cool on the stone for 5 minutes. Cut into pieces using a pizza cutter. That looks sooooo good! It’s really making me crave pizza! I kinda like how you don’t know it’s pepperoni until you cut it open! I’m so glad you enjoyed this dough! It is the BEST. What a great idea, making a stuffed pizza bread with it. I’ll have to try that sometime. I follow the dough, but why my pizza still smells like yeast. IS there is something wrong with my process??? the heat, maybe the yeast? it has a strong yeast smell after baking. i’ve never had that problem so i really don’t know why the baked crust would still smell like yeast. i’m sorry i can’t answer that! I jsut made this pizza bread for my neice’s 8th birthday party. It was a hit! Not a piece left over. Thanx for the great recipe. Melanie: Great to hear! That pepperoni bread is definitely one of our favorites! I like to play around with different recipes, and I’ve seen a few stuffed breads where the dough was braided above the stuffing instead of becoming a log. I really want to try it, but the temperature seems alarmingly high to experiment with – do you think my bread will be alright without vents? Jordie: I’m not really sure. I really think it should be vented to release the steam but there’s no harm in trying. If you’re worried about the braided top browning too much, tent the bread with some foil while it bakes. do you think I could make this ahead of time and freeze it? Just made this – one of the first breads/doughs I had made from scratch! It was wonderful – thank you for the great recipe and wonderful instructions to help me through it! Loved it!